Walled by a forest of palm trees, the Sepang International Circuit, in Selangor (Malaysia), designed by the world-renowned engineer Hermann Tilke, is the circuit that serves as the launch pad for the 2019 MotoGP World Championship. It has long been a popular testing ground due to its unique characteristics and taxing climatic conditions - high temperatures and humidity pushing both bike and rider to the limits. Every year the championship’s stars arrive at this Malaysian track for the opening test of the season. It marks the start of a new motorcycling year and, as explained by the Team Manager of the SUZUKI ECSTAR Team, Davide Brivio, it’s a chance "to shake off the cobwebs of winter”. Indeed, after two months of rest and waiting, in which on track testing is practically banned, and experiments are confined to the four walls of the different racing departments of the manufacturers, it’s certainly refreshing to return to the race track. For the riders, this test is like receiving a new toy for Christmas; "I always want to arrive at Sepang as soon as possible, I’m always so keen to get back on my bike," explains Alex Rins, fifth in the Championship last year. But it’s not all plain sailing… "Being the first test it is so demanding, you have to be at 110% physically. And on top of the heat and humidity the physical effort you put in is incredible", adds the rider from Barcelona. But getting to Malaysia in good condition is not an easy task. How do you train to prepare for the fierce power of a MotoGP bike? "Well, I train a lot in the gym, riding off-road bikes, and I practice flat-track which is good for sliding. But ultimately it's difficult because the MotoGP bike is unique.” So much so that you inevitably feel pain after the first day of testing: "What suffers most in your body is your neck area." But those aches and pains are quickly overshadowed by the adrenaline and thrill of being reunited with the race bike. "The first test of the year is crucial for the riders, who must get their riding instincts back and shake off any rustiness". There are also checks and re-familiarisation to be done on the technical front, “we are all very excited by this test because it is the first time you can check if all the work done during the winter in the factory has been truly successful," adds Brivio. This year, if possible, the first test is even more crucial, "because the test days have been reduced from nine days to six. That's why it's essential to find a base setting that is good for the whole championship". However, apart from being away from the track, winter is not actually a period of disconnection. After a short holiday the team are working hard to plan for what’s to come: "During the winter our job is to prepare for the forthcoming year: the logistics, the structure of the team, as well as renewing the panels, the graphics, the colours, organising the trips, the hotel reservations, the spare parts for the new motorcycles, the new inventories, the study of the data by the engineers, the schooling of the mechanics in Hamamatsu to assemble the new motorcycle ... Everyone has their role and we all must prepare for the new season". As we’ve heard, winter is no time for vacations. It’s time to work on new dreams, new goals, and new technology. In fact, the process of creating the bike that is seen for the first time in the Malaysian test takes about 3 or 4 months, including the design, manufacture and assembly. That's why, when the season ends, it’s actually even more busy for the engineers and team than during the rest of the year. “We have many different directions available to choose on the table. Then, the final decisions are decided in this test in Malaysia ", explained the SMC Technical Manager, Ken Kawauchi. 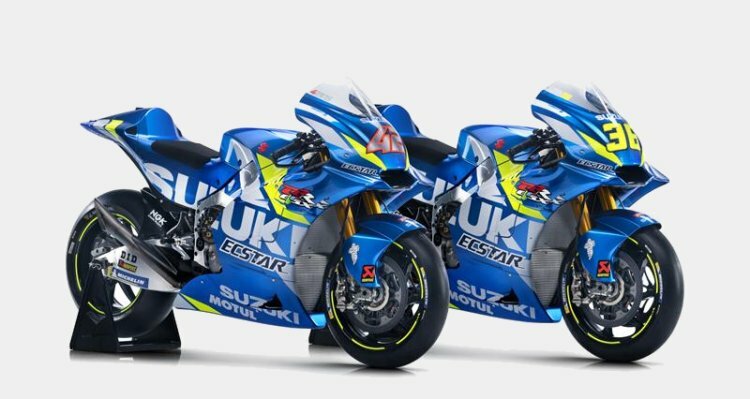 The tests this year are even more important for Suzuki, as Ken-san explains: "Because we have no concessions, we have to finalise the engine, but also the chassis, swingarm, etc ... This test is like a deadline, even though we also have the Qatar test coming. We have to decide the base package for the rest of the season". That's why programming is a crucial aspect. This is something that started during the last test of 2018. "Here we collect all the information necessary for working in the factory during the winter, preparing everything ready for the first test. But even during the winter break we are constantly in communication with the factory", says José Manuel Cazeaux, Alex Rins’ Crew Chief. The spare parts department is one of the busiest during the winter because a full inventory must be made. Meticulous work is carried out, in which thousands of pieces make up the prototypes, and the corresponding spare parts. Everything that will be used during the year must be cataloged. “Sepang is the test where the most parts and pieces are received,” emphasises the Parts Manager, Russell Jordan. Russell, who is originally from the UK but now lives in the United States, manages all these thousands of crucial pieces. “After the last post-season tests in Valencia and Jerez all the spare parts go back to Japan, and in early December I receive a complete list for the new bikes for the coming season. By then I have already updated the ‘parts software’ on the computer, so I then create two lists: one with the parts we do not need anymore, and the second (most important) list, with all the new bike parts”. This list arrives in Hamamatsu before Christmas where everything is prepared and packed into boxes before being sent to Malaysia, where the testing will dictate which parts are rejected and which ones will continue to be part of the development of the GSX-RR. “We have a huge amount of stuff to test. The modifications and final confirmations occur during these few days. The volume of pieces is quite large.” says Jordan. Meanwhile, in Sepang, away from the hustle and bustle of the paddock, sits a container with utensils and tools that the team will use during the test, as well as materials to decorate and build the hospitality units overseas, very different from the ones normally delivered by truck to the European rounds. “In winter we have to plan the contents of the trucks, and the containers that we send away with materials we’ll use during the season. We also have to renew tools, add new panels, new graphics etc …”, explains Roberto Brivio, Head of Logistics. Together with him, side by side, works Mitia Dotta. Among his tasks, he is responsible for coordinating the travel schedule. 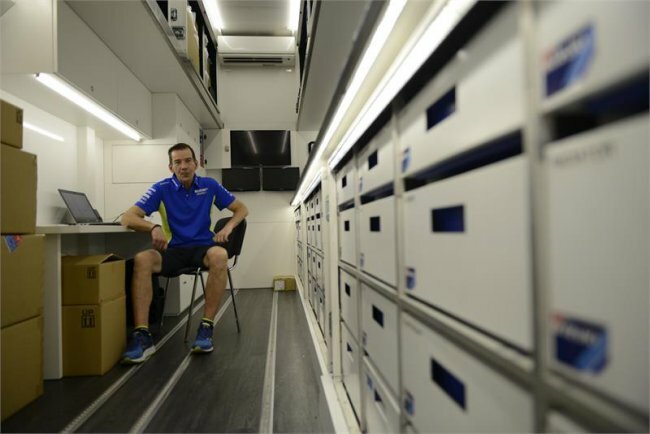 “We start to book flights and accommodation, since we always work a few months in advance, it’s as if the championship never stops!” In Sepang, he also organises the first official clothing kits - with the new designs and logos. “This all needs to be arranged long in advance” he adds. The arrival of the paddock in Sepang is always cause for celebration among all the teams. A community reunited with smiles, gathered together with a common passion. This is especially noticeable among the friends who work together at Team SUZUKI ECSTAR: there’s a real joy about the return to action. “We are all super motivated when we reconnect with our comrades, it’s like our batteries are fully charged! The paddock is, moreover, like a family, when we all see each other again it’s like the first day back at school after the holidays!”, says an exultant Jacques Roca, Joan Mir's mechanic. For Roca one of the most difficult things in a MotoGP team at the mechanical level is the full comprehension and implementation of all the new parts. “This is something we practice during the tests”, he says. But also during the mandatory visit to the factory in the first week of January. “There we catch up, assemble the parts of the new bike and start to organise everything for the new season”, he adds. This training also serves to further define the different roles within the team of mechanics. “Everyone has a specific area or function, although we all know how to do everything”. From the point of view of electronics, a small period of adaptation is also crucial, especially over the past year with the implementation of some rule changes, such as the standardised IMU (Inertial Measurement Unit) and ECU (Engine Control Unit). “The first thing that needs to be done is to regain confidence with the bike. Just as the rider must recover their feelings, it’s also similar in terms of working with electronics, we need a little ‘refresher’ to find the best way of working and the confidence with the means and the tools”, says Claudio Rainato, Joan Mir’s Electronics Engineer. “After a day or two, changes are introduced, new parts are introduced, but because of the new regulations there are not so many options to introduce into the electronics during the year. So this first test in Sepang is the biggest and most decisive opportunity of the year for us to make changes electronically”, emphasises Rainato, who recognises that a large part of the work “is already done in the factory, during the winter, with a certain development level. But the important thing in our case is that the rider is not preoccupied with it, and can easily distinguish between and implement each of the changes”. Current time: 22-04-2019, 10:16 AM Powered By MyBB, © 2002-2019 MyBB Group.